Patanjali Saundarya Multani Mitti Face Scrub contains Aloe barbadensis, Azadirachta indica, Curcuma longa, Mentha piperata, and Citrus aurantifolia as active ingredients. 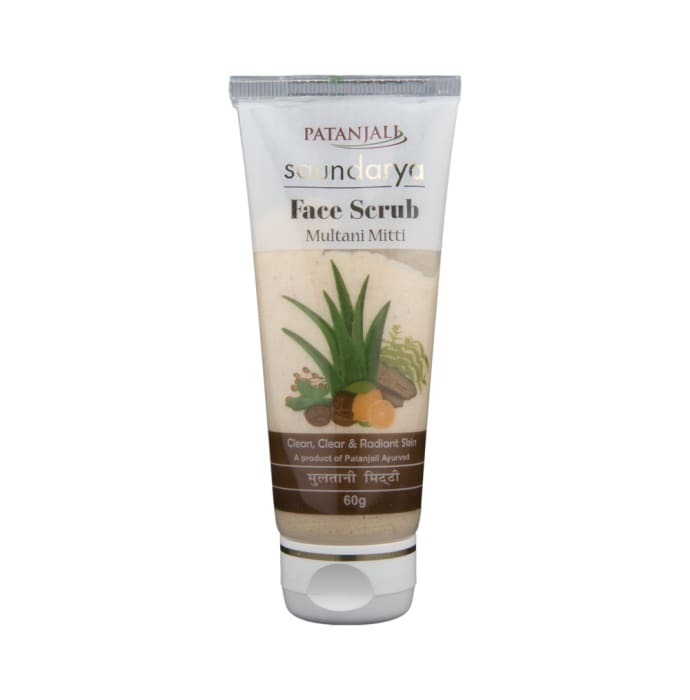 - Patanjali Saundarya Multani Mitti Face Scrub is a unique blend of Multani mitti, herbal extracts, vitamins, and natural scrubbing beads with creamy soap base. - The deep cleansing action removes impurities, blackheads, and dead skin cells. - Neem, Mint and Lemon peel purifies the skin while Multani mitti, Aloe vera, and Vitamins nourish and rejuvenates the skin tissues. Also makes complexion clean, clear and radiant. Apply on wet face, massage gently in a circular motion all over the face and wash with water. Blackheads, pimples, dullness on skin, skin cleansing etc.